Scientists have shown new genetic evidence that could strengthen the link between the role of dietary fats with colon cancer progression. 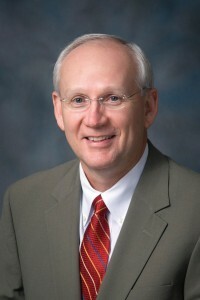 Dr. Raymond DuBois, M.D., Ph.D. The study, led by Arizona State University researcher and physician Dr. Raymond DuBois, M.D., Ph.D., has identified a molecular culprit, called peroxisome proliferator-activated receptor delta (PPAR delta), which, when deleted in a mouse model of colon cancer, stopped key steps required for the initiation and progression of tumor growth. The study was published in the April 21 early online edition of the Proceedings of the National Academy of Sciences http://www.pnas.org/cgi/doi/10.1073/pnas.1324233111. The research team included DuBois’ Laboratory of Inflammation and Cancer members Dingzhi Wang, Lingchen Fu, Lixia Guo at ASU’s Biodesign Institute; Wei Ning, Rupesh Chaturvedi, and Keith Wilson of Vanderbilt Medical School; and Xiaofei Sun and Sudhansu Dey of Cincinnati Childern’s Research Foundation. The DuBois research team has been in pursuit of uncovering the links between inflammation and colon cancer for the past 2 decades. Colorectal cancer is the second leading cause of cancer deaths in the U.S. Evidence for this link comes from data showing that the use of nonsteroidal anti-inflammatory drugs (NSAIDs) reduced the risk of developing colorectal cancer by 40-50 percent. NSAIDs target an enzyme called cyclooxygenase 2 (COX-2), which carries out steps to produce the pro-inflammatory molecule prostaglandin E2 (PGE2), found at high levels in colorectal tumors. DuBois’ research team has long sought to uncover the key molecular steps regulating the COX-2/PGE2 pathway. According to the Centers for Disease Control and Prevention, dietary components high in saturated fats such as red meat are thought to be risk factors for colon cancer. Other known epidemiological risk factors are family history, inflammatory bowel disease, smoking and type-2 diabetes. The cell’s garbage pail for dietary fat, is called the peroxisome. PPARs are central players in regulating the breakdown and storage of fats within a cell, and the DuBois team wanted to investigate the role one molecule, called PPAR delta, had on chronic inflammation and colorectal cancer progression. In a mouse model of colon cancer, the team “knocked out” the gene to make PPAR, and found that the mice showed no clinical or cellular signs of chronic inflammation. Furthermore, when looking at the immune response, they found none of the usual immune cells associated with inflammation. They also measured the levels of COX-2 and found that loss of PPAR had no effect on COX-2 expression. The found that PPAR required for induction of COX-2 expression and high levels of PGE2 production that are associated with inflammation and colon cancer. The research was supported by in part by the NCCRA (National Colorectal Cancer Research Alliance), co-founded in March of 2000 by Katie Couric, Lilly Tartikoff, and the Entertainment Industry Foundation, and the National Institutes of Health.